Location, Location, Location... 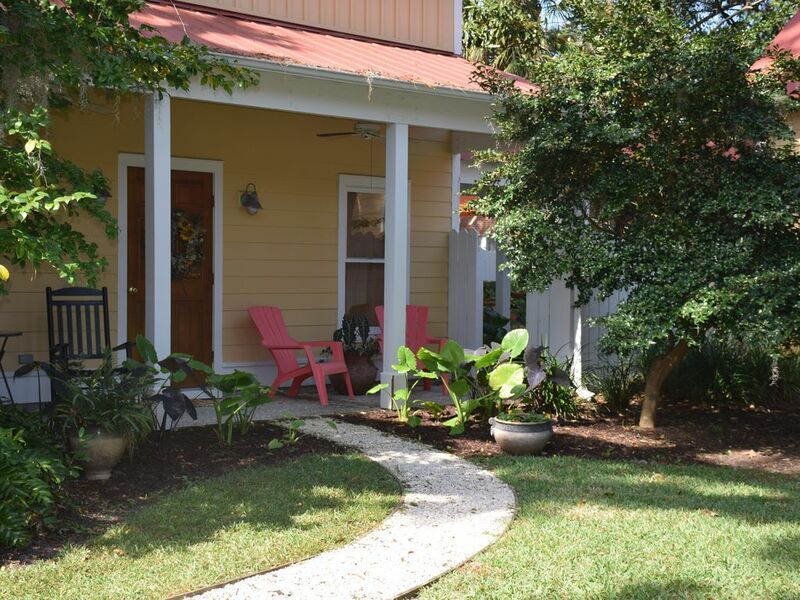 This downtown Beaufort carriage house is a perfect place to stay for your visit to Historic Beaufort. Beautifully furnished and fully equipped for a comfortable stay. The outdoor sitting area is covered and looks out to this charming neighborhood full of moss draped live oak trees, magnolia trees, crepe myrtles, camellias and azaleas. The carriage house is above the detached garage. It has been redecorated, updated and freshly painted summer 2016! It is one very large room with a king bed, two comfy chairs for reading or tv, a kitchen table and 4 chairs and a dresser. There is also a kitchenette with a small frig, toaster oven, microwave, Keurig coffee maker (and coffee pods) and an electric tea pot. Bath has a tub/shower and is sparkling clean! Also have a washer and dryer for your use. Just a fifteen minute walk along the Beaufort River (ICW) to wonderful restaurants, antique and other shops, a waterfront park, marina and historic tours. Or ride one of the bicycles provided for your own self-directed tour of downtown! Centrally located this carriage house is just 10 minutes from Parris Island and 20 minutes from Hunting Island State Park and Beach! You can walk downtown for a horse & buggy historic tour or meet a guide at the marina for a day of boating/fishing. Also walk or ride the bikes on The Spanish Moss Trail - a 15 mile old railroad trail that winds through neighborhoods and has beautiful views of marshes and waterways. Kayaking tours are also available from the downtown area. Your choice of many golf courses are within a 10 minute drive! If you are coming to look at Beaufort as a possible living destination...I am a Realtor with Lowcountry Real Estate and would be happy to assist you. Stop by my office, in the heart of Historic Beaufort, at 820 Bay Street and ask for Colleen! Or check out our website at www.lowcountryrealestate.com! My name is Colleen Baisley. I moved to Beaufort, SC in 2002 from the Boston area. I chose Beaufort because it is a historic city, on the coast and perfectly located between Charleston and Savannah. It has surpassed all of my expectations in that not only is this the most beautiful place to live but the quality of life here is wonderful! I first lived about 2 miles from the downtown historic district but quickly realized that I wanted to be even closer. I live in the house attached to my carriage house that I rent. It is a beautiful neighborhood and an easy walk or bike ride to the shops, restaurants and marina. Real Estate sales is my business. If you are coming for a visit and decide that you may want to live here...I can help you! Stop by my office, in the heart of Historic Beaufort, at 820 Bay St. and ask for Colleen! I chose to buy my home with carriage house attached because it is perfectly located to the downtown historic district. It is located just a block off of the intracoastal waterway and you can walk along the ICW on your way to downtown. You will pass some of the grandest of the Historic Homes in Beaufort. Great location to explore the area as a possible retirement or relocation. You can explore the Historic Area, Pigeon Point, The Depot, Hermitage, Cottage Farm and much more without getting in your car. Jump on the bikes and start your search! Also a great base location to explore Ladys Island and the beach areas. Beaufort is between Savannah and Charleston, and both are an easy day trip. Bicycles Available; A short walk or bicycle ride to downtown Beaufort where you can take a horse & buggy historic tour, shopping, fine restaurants & marina! We just finished our second time of staying at the carriage house and again we thoroughly enjoyed it! Colleen has thought of everything. It couldn’t be any nicer. We look forward to coming again soon! Awesome cozy place. Well appointed by great owners. Everything we needed was provided! The location was perfect! We hope to be able to come back again! We found this spot a great choice for a few days in beautiful Beaufort. It is extremely easy to find, in a nice neighborhood and very convenient to downtown. The apartment itself was very clean, quiet, bright, well stocked with nice towels and had a wonderfully high ceiling. We particularly appreciated that it was furnished simply and attractively. So many places are dark and overdecorated. We would highly recommend it. We loved everything about Beaufort, from the large Waterfront Park with its many benches and swings to the restaurants, magnificent live oaks and historic buildings. Be sure to cross the bridge to explore Hunting Island State Park. The beach has sand soft and fine as flour. The marsh walk (boardwalk) is beautiful and interesting. We especially loved Low Country Produce (right in town), both for its food and its environment, a beautiful former post office. We had outstanding fish at Dockside, just across the bridge on Lady's Island. We hope to return to this special small town. This was just the perfect size spot and an ideal location for visiting Beaufort. The cottage was Immaculately clean, lovely, and every amenity was in place for our enjoyment. Colleen has considered your every comfort. Looking forward to staying there again!! Beaufort and Port Royal are lovely, we were able to explore both on the bikes provided. Easy access to the Spanish Moss trail and the bed was SO comfortable! $75 per week cleaning fee required for guests staying longer than a week.